Dan Han, at right, holds the artist&apos;s concept of "Innovation Rocks!" 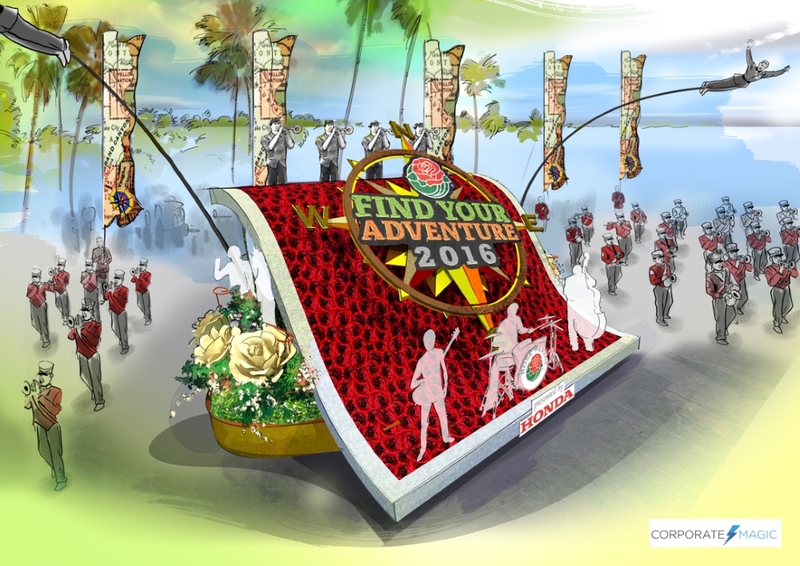 the Destination Irvine 2016 Rose Parade entry. Left to right, Wendy Haase, Destination Irvine; Sam Murray, Managease, Inc.; Kate Klimow, Assistant Vice Chancellor, University of California, Irvine; Linda DiMario, Destination Irvine; Tallia Hart, Irvine Chamber of Commerce; Dan Han, Ignite Payments Agape. What is your first Rose Parade memory? Even those who have never been to the parade in person probably have memories of watching it on television, and some, like scientist Greg Weiss in an earlier post, may have special traditions to go along with it. For Irvine businessman Dan Han, his first "American memory" is of watching The Tournament of Roses Parade on TV when he was a child. "My family emigrated from South Korea when I was 6 years old to find a better life and live the American Dream," he states. "As a child I had no background in the English language and no concept of American culture. Living in my grandfather&apos;s house, we shared the space with my aunts and uncles and their families, 12 people in total. One of my first experiences with American culture was watching the Rose Parade on television. "As a child I was enthralled by the color and pageantry of the event. Seeing the floats and characters as they paraded down the street, my imagination ran wild about what life in America would be like. Seeing all of the happy families and people attending and participating in the parade, I thought that America was a great place to be." Han is a member of the Chamber of Commerce board of directors. His business, Ignite Payments Agape, provides payment processing solutions for businesses by providing ways to accept various forms of payments. These include credit cards and online commerce as well as newer technologies such as Apple Pay, Samsung Pay, Android Pay and Google Wallet. He says, "By accepting payment methods other than cash, businesses open themselves to a much larger audience. A larger audience and more ways to pay generally translates into more revenue for the business." 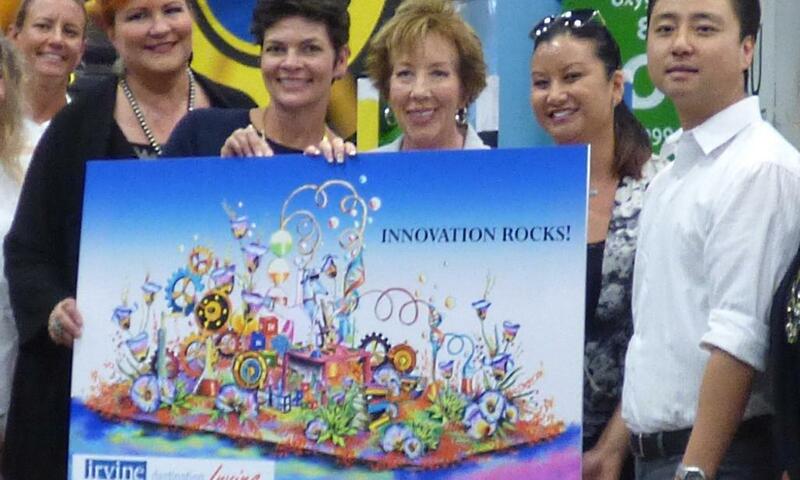 With such a warm memory of the Rose Parade, when he learned the Chamber is sponsoring "Innovation Rocks!" Han says, "I was ecstatic because it brought back those memories from my childhood just coming to the United States. The float will bring Irvine further in the minds of the people throughout the US and around the world. The design is a great representation of the various and diverse education and business opportunities that are here in Irvine. "Irvine and its various communities are very family centered with great access to parks, education, shopping and dining. It also boasts incredible cultural diversity in its population. I believe the exposure that is brought on by this float in the Rose Parade will encourage businesses to move here and want to do business in Irvine. Irvine is already an economic hub with several corporate headquarters and regional offices, ample manufacturing, and huge service industries; coupled with the amazing standard of living, it&apos;s a great place to be." 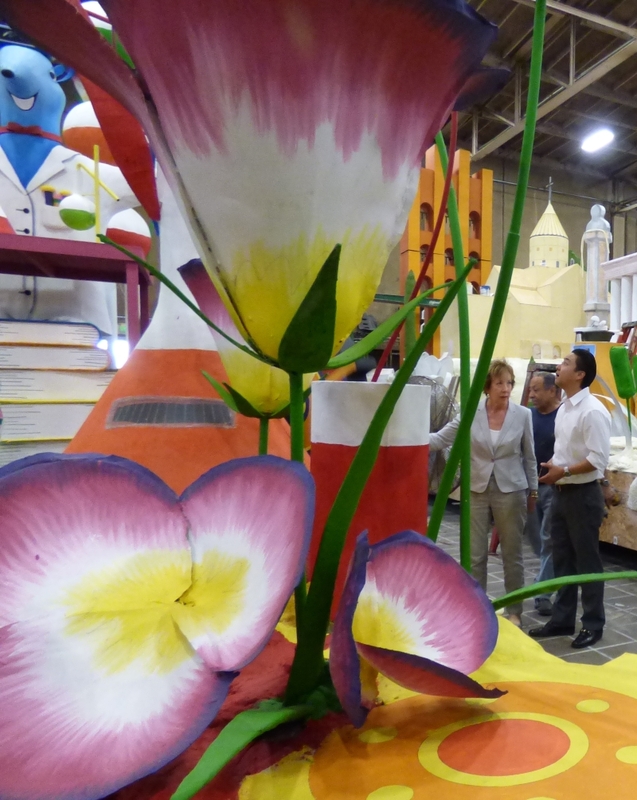 Seeing the float for the first time a few weeks ago at Phoenix Decorating Company in Pasadena, Han craned his neck to see the tip top of the 25-foot-high creation. He says, "The float was huge! Much bigger in real life than I envisioned. The float portrayed many of the qualities of Irvine in relation to the theme of ‘Innovation Rocks!&apos;"
Han says that the business of payment processing must also be innovative in using cutting-edge technology to ensure clients are up-to-date on quickly evolving transaction methods. Currently the parent company, Ignite Payments, is moving merchants to NFC technologies. He says, "When I got into this industry, I was looking for something where instead of selling a product or gadget I was providing a service that had a direct benefit. We meet that by helping merchants to reduce the costs of accepting payments, and providing a personal level of service that is rare in our industry." The name of his office, Ignite Payments Agape, reflects that commitment. "As a Christian myself I wanted my business to embody the values that I&apos;ve found through my faith," Han says. "Agape means brotherly love, or the love we have for one another. With that mission we strive to always do what&apos;s best for our customers, even when it&apos;s hard or doesn&apos;t work in our favor. We will always go the extra mile to meet the needs of our customers to the best of our abilities." When "Innovation Rocks!" glides along Colorado Blvd. on New Year&apos;s Day 2016, Irvine fans will want to be prepared for a glorious experience. These tips will help them be as savvy as seasoned parade-goers. •	The parade starts at Orange Grove just south of Colorado Blvd. promptly at 8 a.m. and takes about two hours to get to the end of the route on Sierra Madre Blvd. Parade-goers can find a good spot on the street up to an hour or two before the parade arrives, but the closer the spot is to the beginning of the route, the earlier they should arrive. Grandstand seats, available from Sharp Seating Company, provide the assurance of a reserved seat and a place to sit. Viewing is best from the south, or "camera side" of Colorado Blvd. •	To get there, get on the 210 West into Pasadena. Exits from Allen to Fair Oaks and head south to the parade route. Drive time increases closer to Colorado Blvd., so allow plenty of extra time. Reserved parking is available from Sharp Seating (626) 795-4171 and Easy Parking Service (626) 286-7576 and there are plenty of private lots that sell slots for the Rose Parade on the spot. •	Public transportation from Irvine isn&apos;t readily available, but a compromise is to exit at Madre/Sierra Madre Villa, turn right and right again into the free parking structure for the Metro Gold Line. Take the train to Allen Avenue, Lake Avenue, Memorial Park, or Del Mar station and follow the crowd to Colorado Blvd. •	Dress in layers; early mornings can be very cold, but it warms up through the morning. Travel light with tote back to stash snacks, beverages and those extra layers. Keep money or wallets in a front pocket and limit valuables to cash, credit card, ID, car keys, and tissues. Food, beverages and souvenirs are sold along the parade route. 1. There are three demarcations for street viewing: the sidewalk, the curb, and the blue line. The blue line is the absolute limit for street viewing. Viewers may not block the sidewalk. There must be enough room for people to easily pass between storefronts and the viewers. 2. Don&apos;t throw things. Silly string, marshmallows, tortillas, anything. 3. Don&apos;t bring contraband. Weapons, sticks, poles, glass bottles, alcoholic beverages, ladders, or any items which may cause injury or interfere with the parade or spectators&apos; enjoyment of the parade are banned. Accessibility issues: Leave a voice mail at (626) 744-4782 or email Robert Gorski, City Accessibility Issues Coordinator, rgorski@cityofpasadena.net.